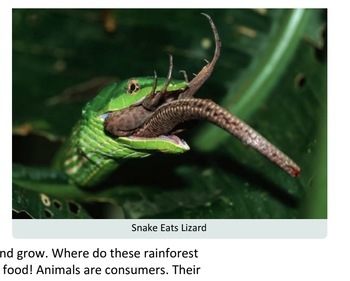 Students read text and view rich, authentic media as they learn about energy flow and food chains in the rainforest. The lesson pack contains 9 pages and was written for grade 2 students but is also appropriate for students in grades 1 and 3. This lesson typically takes 2 sessions to teach. The number of sessions depends on depth of study, completion of assessment, and amount of session time devoted to class discussion. The content and media have been designed to encourage class discussion. This recommendation is based on an estimate of 30 minutes per lesson for grades K-2 and 40 minutes for grades 3-5. 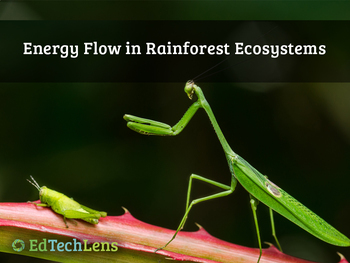 The high-interest rainforest theme is used to present NGSS-aligned life science content. The format allows for teacher-led lessons on a digital display as well as small group or individual use on computers. Students can use independently on iPads or computers for enrichment, reinforcement, or at science centers. Content is engaging and helps meet nonfiction literacy requirements. NOT YOUR GRADE LEVEL? -- Search this site for more “EdTechLens” content. NOT YOUR PREFERRED FILE TYPE? Lessons in PDF, EPUB, and PPTX formats are or will be available. -- This same lesson content also appears in larger unit packs, and some media may also appear in Rainforest Journey media resources packs. -- This lesson is excerpted from the Rainforest Journey K-5 digital life science program produced by a team of educators and media producers. -- Additional features available in the full program include audio tracks for lessons, activities, primary sources, assessments, and data analytics. -- Some of the additional features are available in unit offerings. For details, search this site for document named: “Rainforest Journey Life Science Unit Lesson Packs for K-5 Contents List”. Additional copies may be ordered at a discount for individual or small group learning. Contact Steve at info@edtechlens.com. Usage of any material, including text and media, in this lesson pack is illegal except for use by the single teacher or home user who has purchased it. Please do not share with another user or online. Doing so is a violation of copyright and the Digital Millennium Copyright Act (DMCA).